AUSTIN - When you hear the course name Barton Creek-Palmer Lakeside, one of two images generally comes to mind - the legendary golfer and designer of the course Arnold Palmer, or holes played along a beautiful lake. One out of two isn't bad. The first one is accurate. Palmer designed the course that opened back in 1986 as Hidden Hills. In 1989, Barton Creek purchased the club and renamed it. As far as lakes are concerned, yes, there is a main lake that is viewable on some of the holes, but with the recent drought experienced in Texas and the Hill Country, there isn't much. In fact, much of the water has been replaced by plant life. Despite this, the Palmer Lakeside Course, which hosts 30,000 rounds a year, still offers some of the most spectacular views in the Hill Country and is without question one of the prettiest courses in Texas. 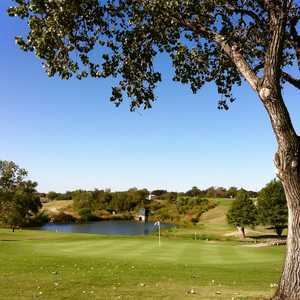 In fact, Palmer Lakeside was rated in 2000 as one of the "The 50 Best Courses (In Texas)" by the Dallas Morning News. The course is pretty flat throughout its entire 6,657-yard layout with one exception - the par-4, 400-yard first hole. With the clubhouse to the left and overlooking the course, this hole features a tee shot from the elevated tee box to a fairway that is approximately 75 feet below and features trees to the right and left, a common element prominently seen in this Palmer design. Following No. 1, you are faced with a stretch of seven consecutive holes that feature a "forced carry" shot at one point or another on the hole. No. 2 is a dogleg to the left that includes a tee shot over a small pond to the left. With a solid drive, you have several options: you can go for the green in two and attempt to clear another pond that crosses in front; play it safe and lay up short of the pond for your third shot to the green; or hit your second shot to the right of the green and a group of trees, where the fairway continues to the right of the pond. Whatever you choose to do, all approach shots will be to the Champions Bermuda green that can be pretty slick and is protected by several bunkers. Nos. 3 and 4 also featured forced carries over water. The par-3, 162-yard third hole is a short, but intimidating hole. All that sits between you and the green, which has a bunker to the right, is the wet stuff. No. 4 - a 418-yard, par 4 - is a dogleg to the left that is slightly downhill and features a carry over water off the tee to a fairway with bunkers right and left. Although three of the first four holes at Lakeside include carries over water, the remaining holes on the front don't include any water but can be equally, if not more treacherous. Hole Nos. 5 through 7 all require shots over large wooded canyons. Both the par-4 fifth hole and the par-4 seventh call for second shots over the canyon while the par-5 sixth and the par-3 eighth, require the same type shot off the tee. On No. 5, a short 395-yard slight dogleg to the right, your best bet is a middle iron off the tee. This will leave you with a second shot of approximately 170 yards over the canyon and between the groups of trees on the right and left to the green. No. 7, the most difficult hole on Palmer Lakeside at 403 yards, is similar to No. 5 as it is a dogleg to the right with a lay-up shot off the tee to a canyon approximately 250 yards out. The second shot is, like No. 5, to a green with a canyon in front and trees to the right and left. No. 6 is easily the longest hole on the front side at 565 yards and it plays every bit as difficult as it is also the No. 3 handicapped hole. Off the tee you must carry your ball over a canyon through a group of trees on both sides of the canyon to a fairway that is lined with trees also on both sides. Add into the mix a dogleg to the left and you have one challenging hole. No. 8, which also is a forced carry off the tee, is considerably shorter at 201 yards. It can play difficult however, as your tee shot not only has to carry the canyon, but it must also avoid a group of trees on the left and a bunker to the right. On the back side, Lakeside is similar to the preceding nine with numerous forced carries. The first on the back nine occurs on No. 11. This par 3 is 201 yards of sheer beauty. 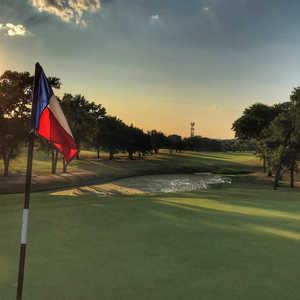 Identified as the signature hole of the course and ranked as one of "The 18 Most Beautiful Holes (In Texas)" according to the Dallas Morning News, No. 11 includes a carry over a small pond with a creek running down the left side the entire length of the hole. In back of the green is a spectacular waterfall standing approximately 50 feet tall. After you have made it to the green, all that can be heard is the sound of water running next to the green and cascading down the waterfall. Following Nos. 12 and 13, a par 5 and par 4 respectively, you are set to play the second of three par 3s on the back. No. 14, like No. 11, offers a stunning view. Although there are no waterfalls, you can see the surrounding countryside and what's left of a portion of the lake from the tee box. It is also unique because of its number of greens. That's right - number of greens. This par 3 offers you the option to play to one of two greens. One is to the right and is the smaller of the two greens. It also plays shorter. The green to the left is more narrow and longer, and features a ridge in the middle. Either green, you must shoot over a heavily wooded canyon. Definitely, a pair of greens to remember. Heading toward the clubhouse, No. 16 is another hole that offers several options off the tee, not in the number of greens on the hole, but the number of ways to attack this dogleg to the left. Many opt to take a shortcut and go left of the group of trees that sit on the left side of the fairway at the dogleg. This also takes the fairway bunkers out of play. Your second shot is to a green that is protected by a tree in front and to the right, and two bunkers. No. 17 is the last of five par 3s at Lakeside. It measures 163 yards and features yet another forced carry over water. The green, which has water in front and along the left, has additional protection by two large bunkers on each side. To conclude your round, you must make up for your descent off the first tee. The par-4 No. 18 is a 381-yard uphill dogleg to the right. Off the tee you hit to a fairway that has several trees on both the right and left, as well as several bunkers. Your second shot is blind to a green that features a bunker in the front left. After reaching the clubhouse you can look back over the 18 holes you just played and get a much better appreciation for the course layout. 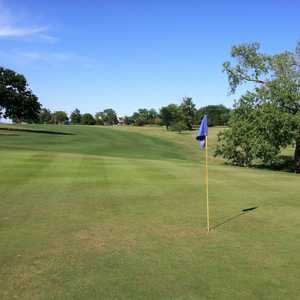 According to Bobby Day, developer of the Barton Creek Lakeside community, this was an ideal spot for the course and its layout for several reasons. "The topography of the land was great because it had rolling hills, great trees, and quite a few places to put the seven lakes." Add Arnold Palmer into the equation and you have a beautiful course in the middle of the Texas Hill Country. Amenities: Putting green and a driving range. Directions: From Austin's Bergstrom International Airport: As you exit the airport on Presidential Blvd., make a left on Highway 71 heading west. Drive approximately 35 miles to Paleface Ranch Road. Follow the signs.